Life is like one big jigsaw puzzle. Over the course of your life, you will have thousands of puzzle pieces that are supposed to fit and create the bigger picture. You know, the one that’s found on the front of the box. When attempting in putting the puzzle together, sometimes we get too excited or impatient and try to force the pieces in certain spots or areas where they don’t belong. We get ahead of ourselves to the point where we become frustrated because it’s not turning out how we expected it to be or in the time frame we thought it should have been done in only having to start over again. There’s nothing wrong in having to step back at times to take another look at the bigger picture. Some pieces i.e. things, people, and/or situations have to be shifted around in order for the picture to come together, but it can only be done when the placement and timing is right. As you can see from the picture on the box, life’s puzzle has already been laid out for you. 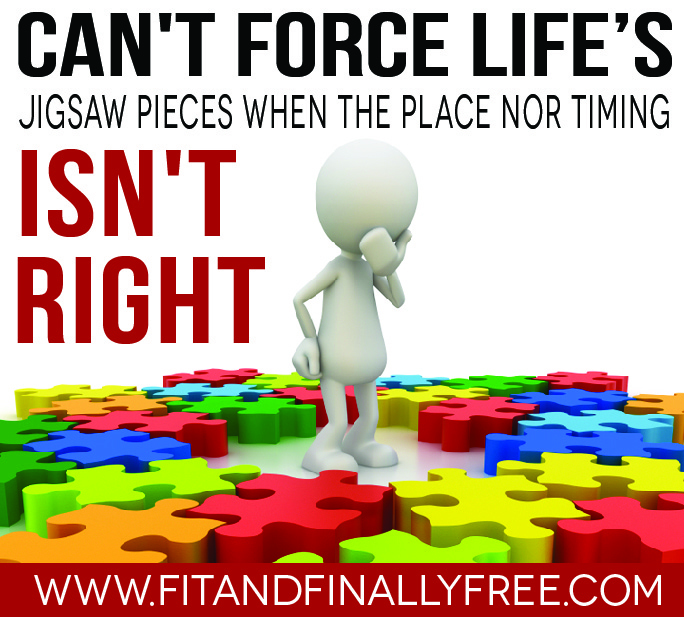 It might take a little longer for you in seeing your picture coming together because of the wrong moves you have made, but it’s not too late to pick up the pieces. That’s when your faith and patience kicks in. You don’t know how and you don’t know when, but what you do know is the promise of something beautiful when all of the pieces finally fall into the right place and at the right time.